In a mockery of “stability”, the prized acheivement of the Putin regime following the “wild 1990s”, the pyramid built by Tima Radya and his crew in this video is a precarious stack of heavy metal riot shields. Slightly angled on their sides and punched through with their characteristic peepholes, this threatening symbol of power has been turned into an object of ridicule. With a red carpet leading to the base of the pyramid and a golden throne on top, the work satirizes the position of the Russian government, its shaky authority built on violence and coercion. As the pomp of the military march ends, the pyramid collapses like a house of cards. Timofey Radya’s street-art sculpture, composed of 55 riot shields a red carpet and a throne, was made in an atmosphere of intimidation and repression of the political protest movements that rocked the country following the fraudulent Russian legislative elections of late 2011 and the presidential election of early 2012. Nevertheless, it retains a certain light-heartedness, not to say hope. 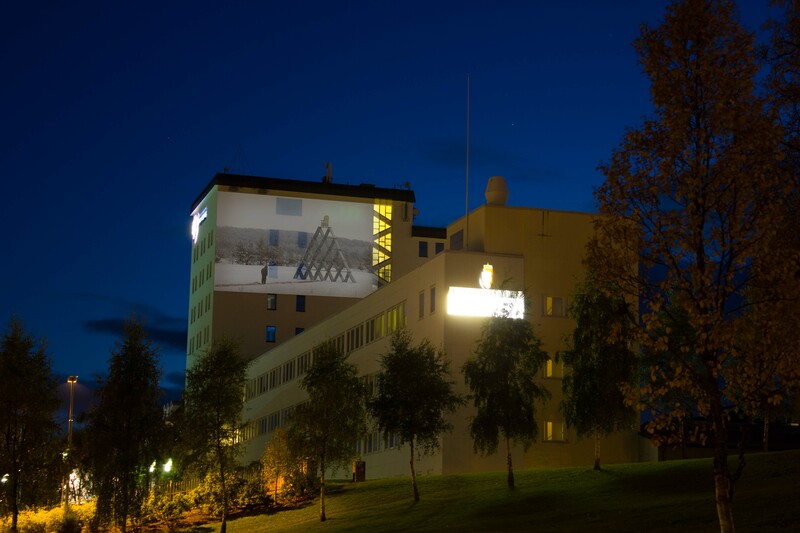 For RE-ALIGNED ART, “Figure #1: Stability” is screened every evening from sunset until midnight on the wall of the Troms County Council building, which stands adjacent to the art hall.